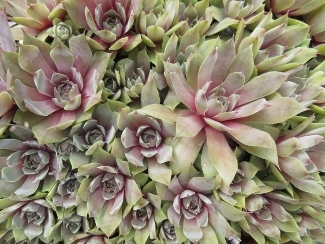 Joy Creek Photo Archive (c) all rights reserved Sempervivum 'Topaz' is a mid-sized hen and chicks with 2- to 3-inch rosettes of succulent leaves. The leaves are gray green, lightly haired and have red, pointed tips. Use it in a rockery or on a wall. June and July. 1 in.